The VUEDrive™ Systems Engines provide VUE loudspeakers with a sophisticated, networked DSP and amplifier solutions that enable optimal performance when combined with almost any VUE loudspeaker system. 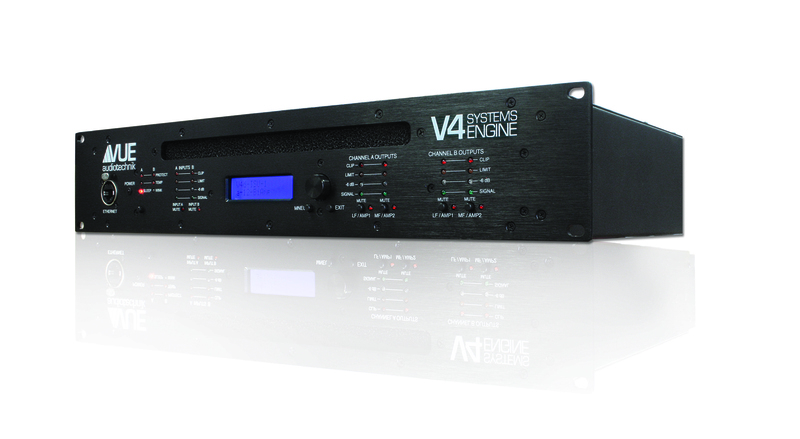 The VUEDrive™ Systems Engines combine next-generation DSP technology, onboard SystemVUE networking, and powerful, high-efficiency class D into a 2U rack mount chassis. The line consists of three models, including the 2-in/4-out V4, the 2-in/6-out V6 as well as the 1-in/3-out V3. Both the V4 and V6 are available in either touring configuration (with front panel LCD interface) or installation configuration (without front panel LCD interface). At the heart of the VUEDrive™ Systems Engines is a powerful and fully customized integrated circuit that handles all processing and system management, including speaker protection, system-optimized alignment of EQ, time and crossover functions, as well as configuration settings and SystemVUE network capabilities. This sophisticated DSP circuit is used across multiple VUE product classes, including the h-Class powered loudspeakers. This consistency ensures that VUE DSP and networking functionality is identical regardless of product class and that different VUE product classes can be easily networked together. The rugged analog input stage accepts input voltages of up to 10V RMS (+22dBu) thus matching any source on the market today, and feeds one of the best converters available on the market today, which is coupled with precision analog components and circuits, raising the definition bar to the levels of high-end esoteric Hi-FI audio systems. 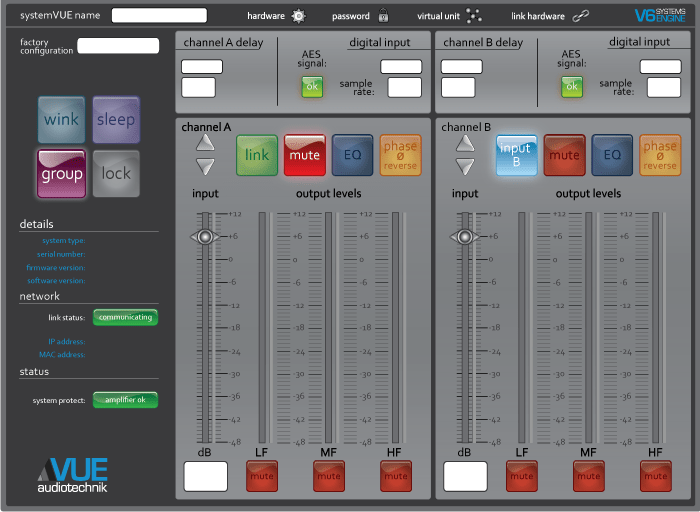 In addition, VUE’s powerful DSP architecture makes it easy for our engineers develop new software updates with new and more “factory presets” to expand VUEDrive’s configuration programming so that the V242, V3, V4 and V6 Systems Engines can be optimized for use with an ever-expanding selection of VUE Audiotechnik loudspeakers. From the simplest i-Class configurations to the most advanced al-Class-based flying rigs, the VUEDrive™ Systems Engines are tightly integrated with all VUE Audiotechnik product classes for optimal sonic performance and simplified setup. The feature set of the VUEDrive range is expanded through regular firmware updates (field installable). Our ongoing software efforts is developing, testing and releasing both new software and firmware which expands the ability of our SystemVUE software to control large groups of Systems Engines (for large portable and installed systems). Other capabilities in development will allow easier implantation of advanced functions like beam steering. VUEDrive Systems Engines ship with SystemVUE networking capabilities already onboard. There’s no need for additional cards or retrofitting. The SystemVUE network connects any VUE DSP-enabled product to a Mac or Windows computer via a wired or wireless Ethernet connection. And because SystemVUE networking technology is compatible with standard IP protocols, users simply plug-in, and the product will automatically recognize and connect to virtually any kind of IP configuration, including DHCP based networks, a fixed IP network, or even an ad hoc network (directly connecting to a computer via Ethernet cable). Whatever the configuration, it just works. Once connected, the companion SystemVUE software allows a user to access any single unit, or entire networks of them, through a highly intuitive user interface. Device and network specific windows make optimizing and monitoring easy, with controls for input/output levels, volume, mute, delay, input source and the ability to monitor a broad list of parameters. 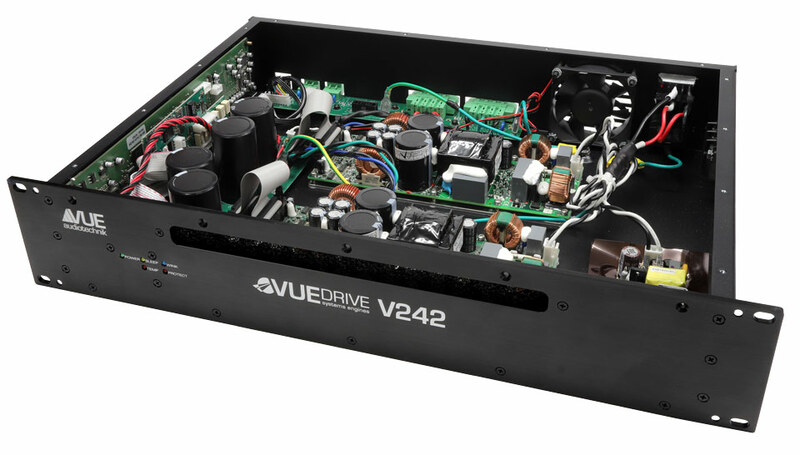 VUEDrive Systems Engines benefit from highly efficient Class D amplifier circuitry, which allows for massive output and headroom from an extremely compact form factor while producing significantly less heat than more conventional designs. This allows th e 2U-sized V3, V4, and V6 to deliver impressive amounts of pure, clean power while maintaining a “cool composure” under the most demanding conditions. From there we add a lightweight, fully protected switch mode power supply with auto voltage detection for hassle-free worldwide operation. Self-protection circuitry includes input limiter, short-circuit protection, DC protection of output, under and over voltage protection, intelligent mains fuse protection, power stage overload protection, and temperature protection of both transformers and heat-sinks. The V4 Systems Engine is a 2-in/4-out configuration that supplies an impressive two channels at 1600W for the low-frequency, and an additional two channels at 550W for the high frequency. The 2-in/6-out V6 Systems Engine retains the v4’s svelte 2U chassis but adds two more amplifier channels. V6 output includes two channels at 2500W for the low-frequency, two at 800 W for the mid frequencies, and two at 800W for the high frequencies. The V6 can also be software configured to provide four channels at 2,500 watts for specialized applications. The new V3 designed for use with the al-12 system features 1-in/ 3-out channels, providing 1600 watts sine wave or 4000 watts burst for each of the low and mid frequency channels, and 500 watts sine wave / 1000 watts burst for the high frequencies.